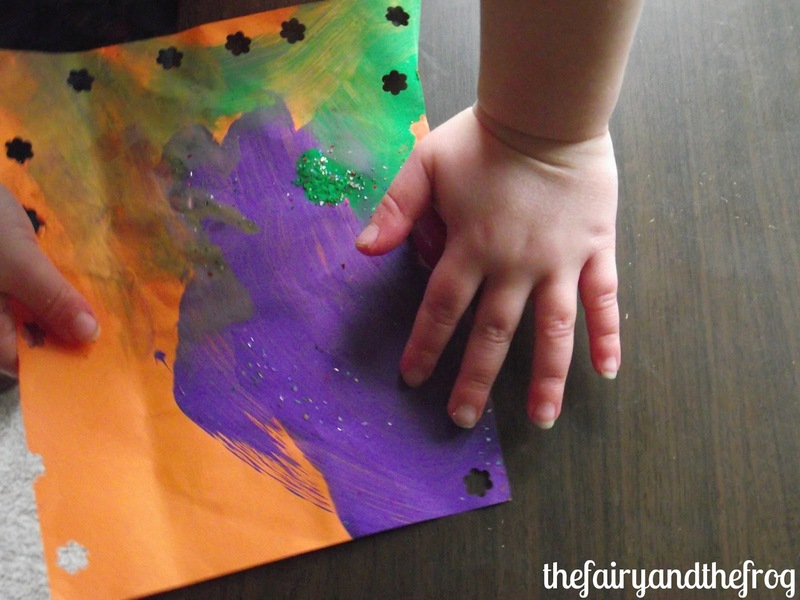 The Fairy loves to hole punch. Our flat is frequently littered with bits of confetti produced with industrious hole punching. She is very fond of my selection of craft punches as they produce interesting shapes. She is also fond of painting and printing - as a process rather than what she produces. 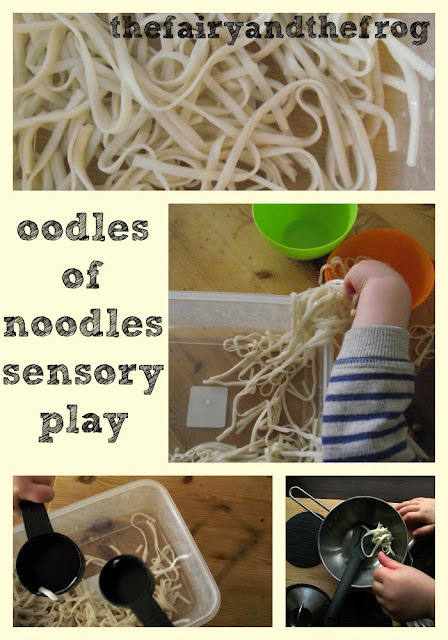 Both these activities are great fun and she learns lots from doing them. I often let her combine these two loves and punch her own creations. 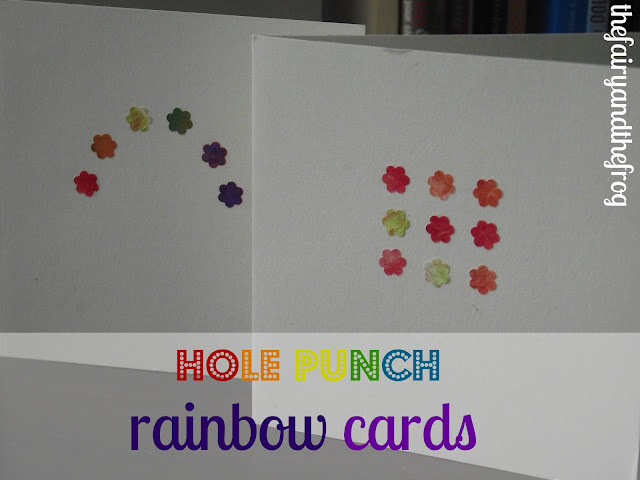 The by product of all this hole punching art work is lots of beautifully rainbow coloured shapes (or what ever colour she has been using to paint or print that day!) 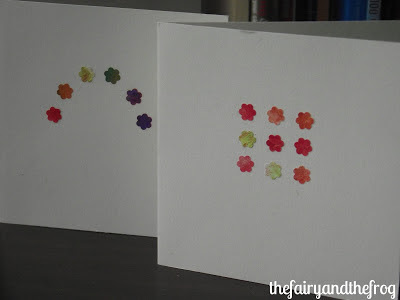 When arranged these make striking and unique designs (a bit like the originals!). Perfect for cards and a great way to preserve art work. 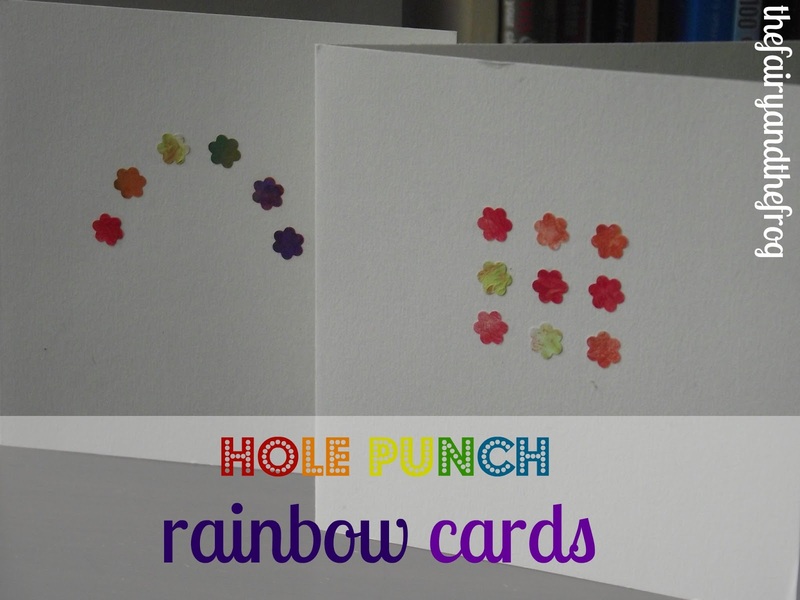 Depending on how the paper is painted it helps to get a range of colours if you cut the paper into smaller strips (other wise the hole punch can only reach the outside edge). You can use any design you like but I really like using geometric style patterns (like a square or a line of three) in similar shades or a rainbow shape using rainbow colours. The are perfect for grandparents. 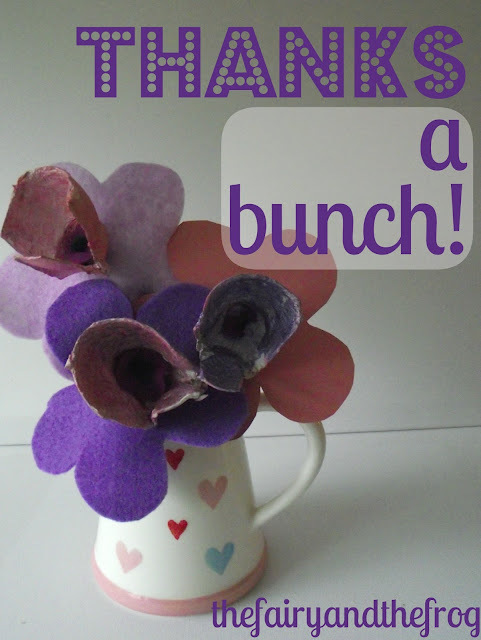 We demonstrated this craft along with another card design on a Google + hang out, along with another why not take a peak. 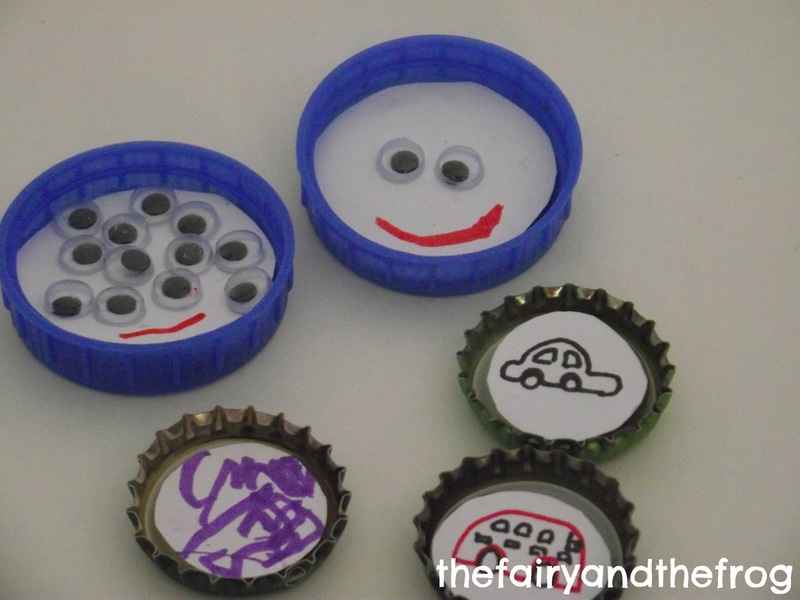 This week we joined in with Maggy from Red Ted Art and some other bloggers with a fun Google + hangout sharing bottle top crafts. 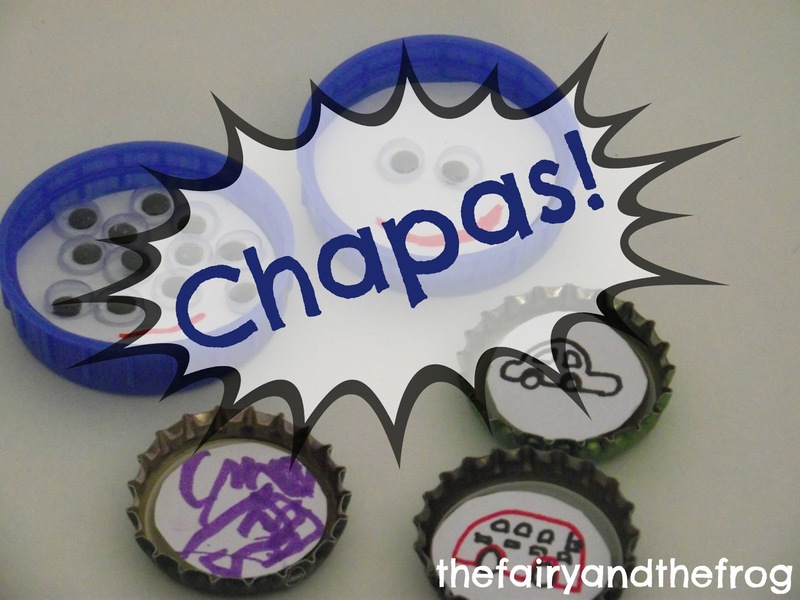 We made the fun and frugal Spanish take on marbles- chapas! This traditional game was played by children on the streets of Spain. 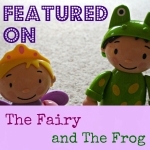 As The Papa is Spanish we try to involve The Fairy and The Frog in Spanish culture (e.g. songs, games and food) as well as speaking Spanish with them. 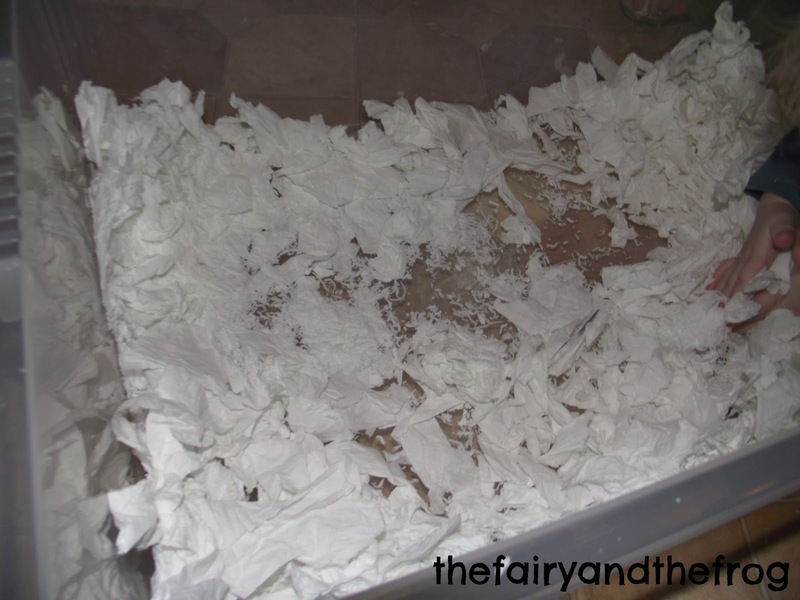 This is really easy way to do it (and its good fun too, especially for The Fairy who loves collecting things!). 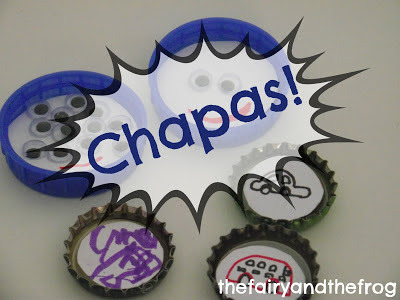 To play chapas you need to take a bottle top (if you aren't happy with your child using a metal one you can use a plastic one instead) and add a weight. We blu tacked in a penny. 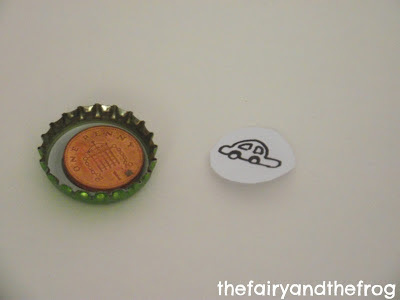 Then draw around the bottle top and decorate the paper circle (handy tip - make sure it fits before you decorate the first time we made these we didn't and I ended up butchering the Fairy's master piece which was not approved!) 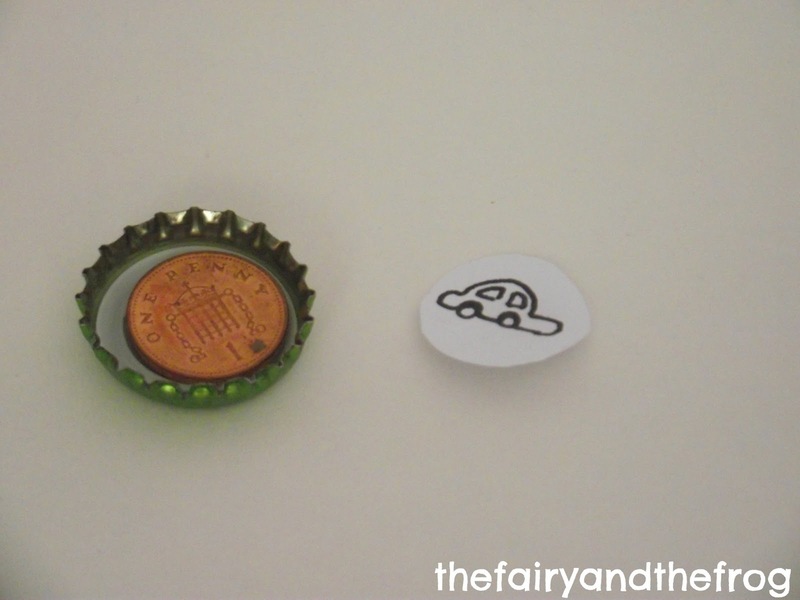 We fixed ours on top of the penny with blu tac. Your decoration can literally be anything (as long as it doesn't prevent the chapa from moving when you hit it!). 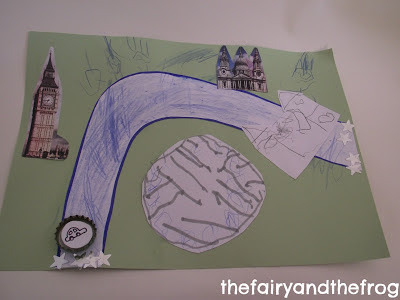 We made monsters, faces, transport and writing. You could also cut out a favourite character from a magazine. 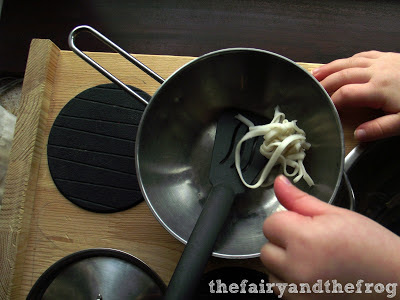 Once you have made your chapa you need to make a track. Traditionally they are played on tracks chalked on the pavement. Because it was very rainy we opted for an indoor version. 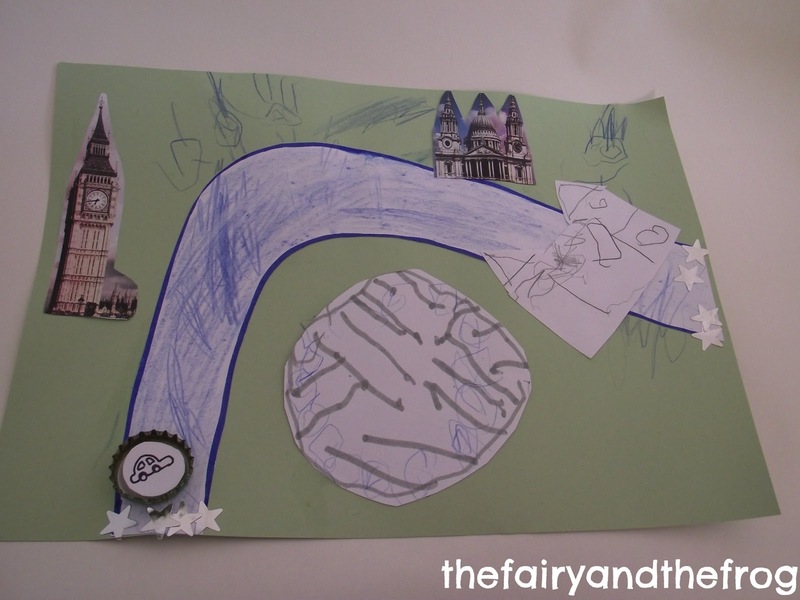 We drew and printed pictures of famous London landmarks to make a river Thames collage. To play the game take it in turns to use your finger to hook the chapa around the track. The person who gets round the track first wins! Why don’t you pop over to You tube watch the video and see the other crafts demonstrated. Or hop over to Mama Smiles - they explained how to play marbles the French way. 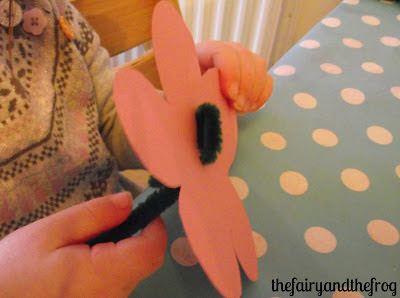 These flowers are really easy to make and make a fab room decorations or a thank you card. They are perfect for Easter and Spring time. 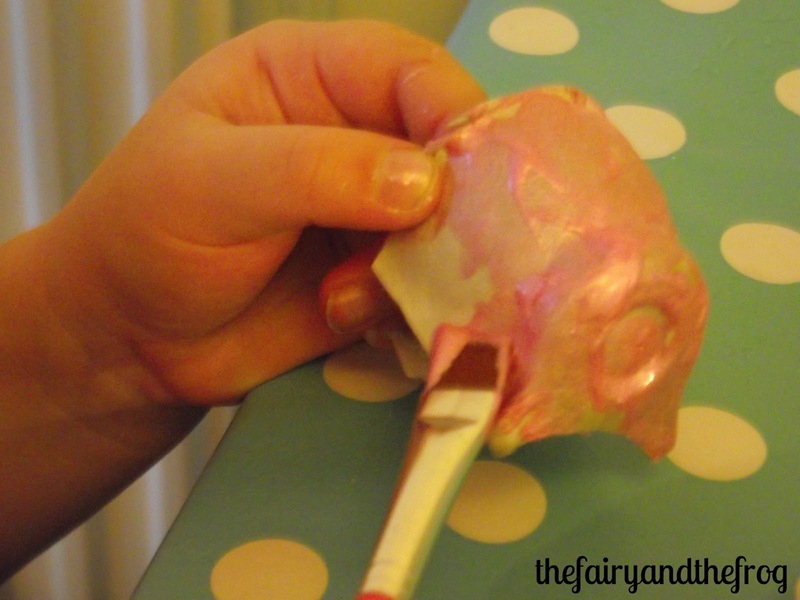 The Fairy carefully painted egg cartons. Then we cut out flower shapes from coordinating card and felt. The Fairy cut out leaves which we also threaded on. As we were making cards she wrote a message on the leaf. If you wanted a more traditional card you could always stick the finished flower onto a blank card. I think these also make a great 'get well soon present ' for someone who is in hospital. We found that the flowers stand best in the vase if the stems were twisted together to make a bunch. Who do you think would like some home made flowers? If you've never played with clean mud before - I urge to give it a go. 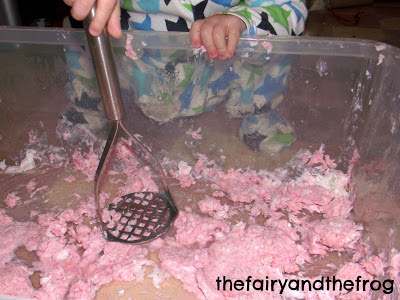 I'm not going to lie it is messy (if you have a garden it might be worth doing outside) - but its lots of fun! It feels just like mud but its clean. We made a special Valentines version. 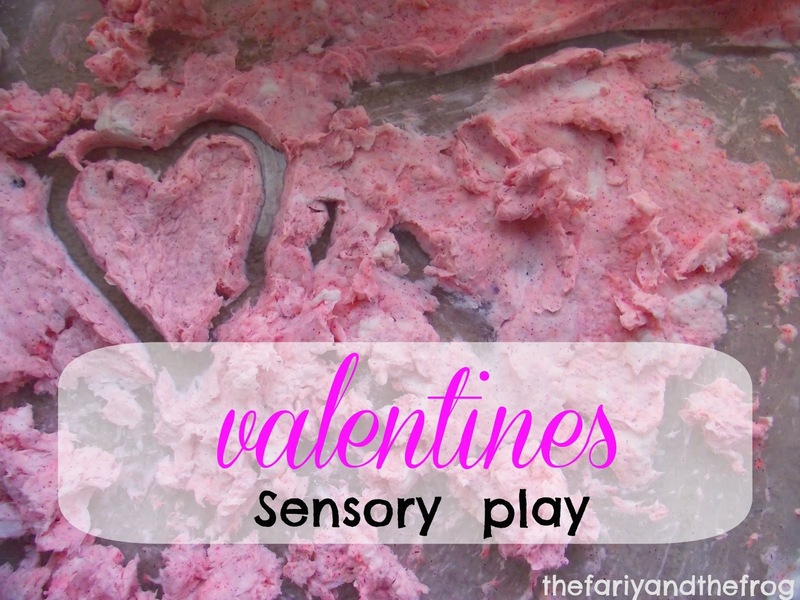 We then mixed it with some warm water (the water needs to be warm enough to melt the soap so this bits a grown up job) For a valentines touch we added a tiny bit of rose scented bubble bath (which was pink) and red glitter. 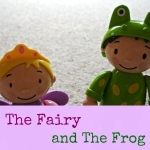 Both The Frog and The Fairy loved playing with it. It was great using a big box so they could both play at the same time - great for cooperation. 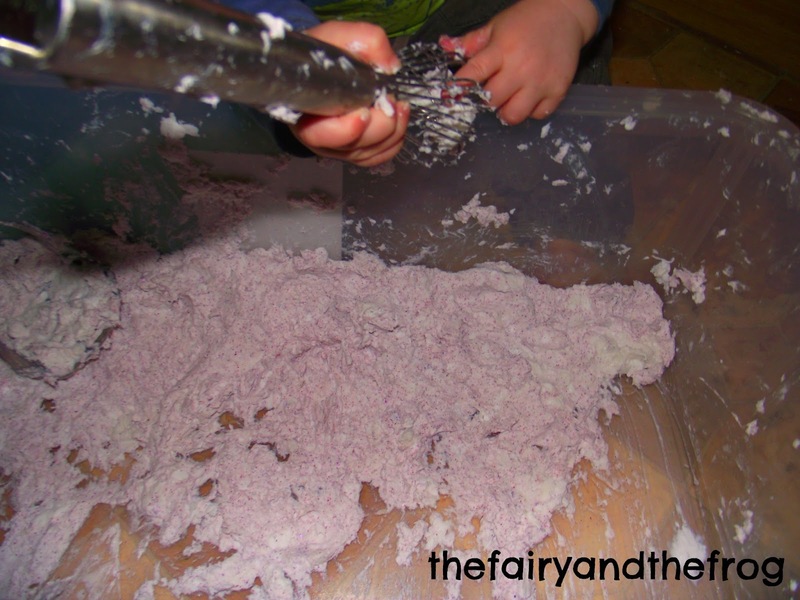 It's great for whisking and swashing with a masher. 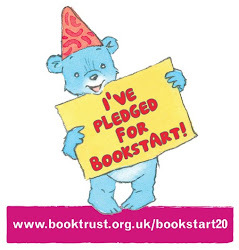 Or with your hands (the added bonus being its a great gross motor exercise too). 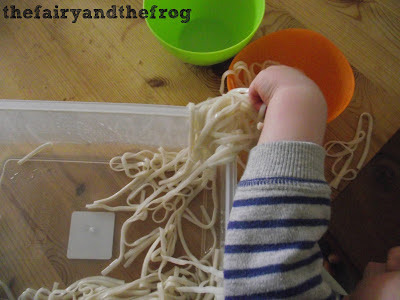 The next morning The Frog requested we play with it again (he loved it so much we had a good play before breakfast!) 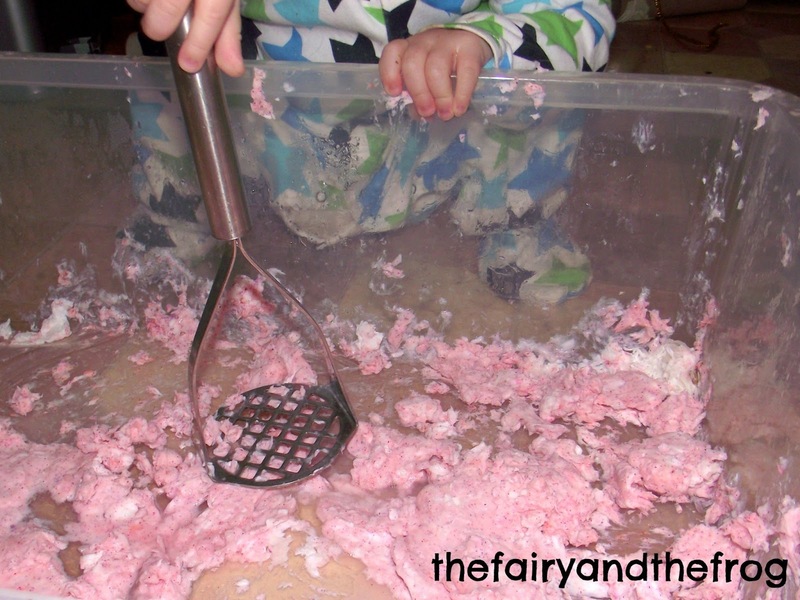 The Fairy noticed the mud had turned a deeper shade of pink over night. Language used: tear, rip,stir, whisk, mix, squash, press, soft, pink, shiny, flowers (when talking about the smell). Those of you who follow us on Twitter may have noticed that our avatar is now sporting some cute red noses. 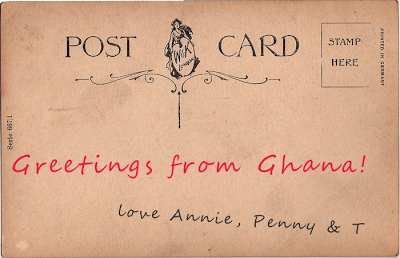 This is support of some rather wonderful UK bloggers, Mammasaurus, MummyBarrow and Alexander Residence who have been visiting Ghana to raise awareness of the amazing, life changing work that has been done through the fundraising efforts of Comic Relief over the last 25 years. Hello The Fairy and The Frog! This morning we visited a vaccine clinic in Accra and observed mothers taking babies for their jabs. This photo shows a mother waiting for her daughter's vaccination - she was such a character! 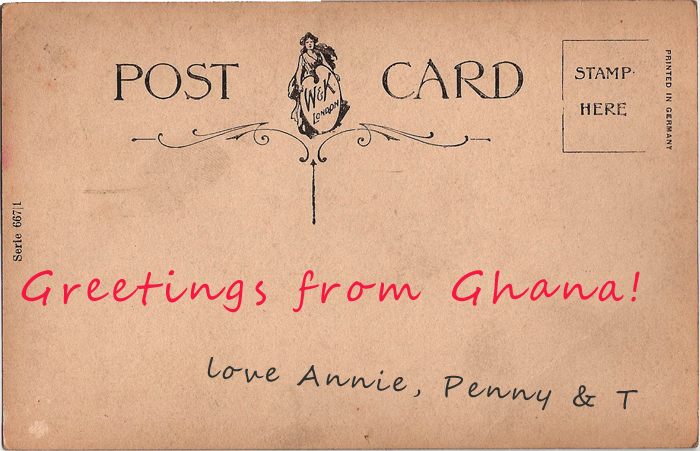 Do you have any fund raising plans this year for Comic Relief? We'd love to know what they are - leave a comment below. With Chinese New Year this week end we thought we'd do a spot of noodle play. 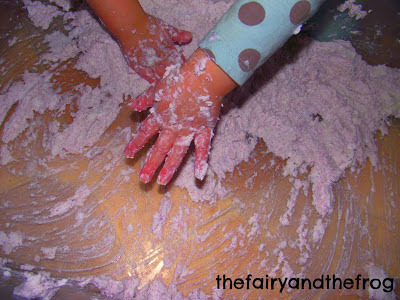 I love activities that both of the kids can participate in and also love watching the difference in how they both play. The Frog is very much into putting things in and out of containers ( the teacher-ery description of this is 'enclosing'). 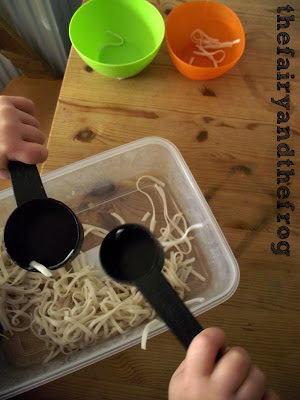 This included the noodles. He loved squishing them as he filled bowls, then put them back into the big container. Surprisingly he didn't try to eat them! The Fairy was less keen to touch them but still wanted to move them - she preferred a spoon. She later requested to do some cooking with them in her play kitchen (as a side note I made her kitchen before I started blogging - one day when I'm organised I'm planning to write a post on how I did it!). This activity was great for using adjective words. 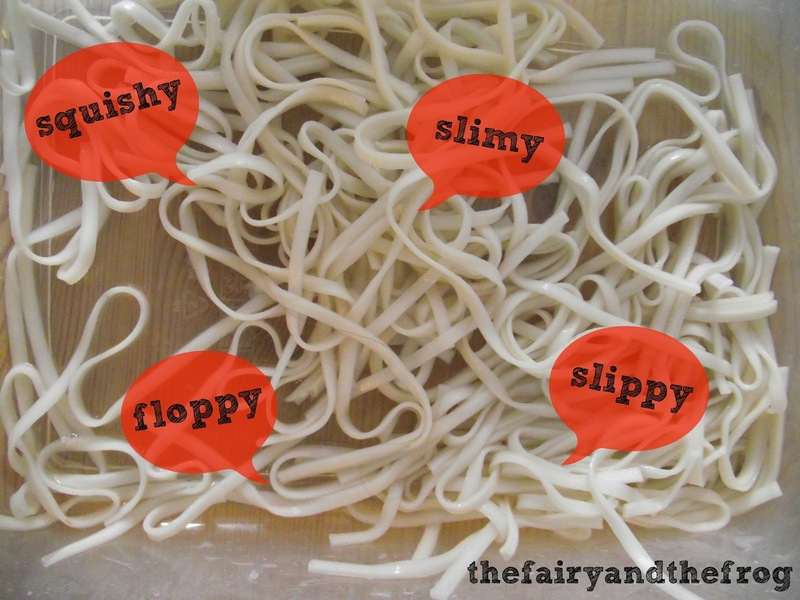 Adjectives are so much easier to learn if children can feel and experience the word!